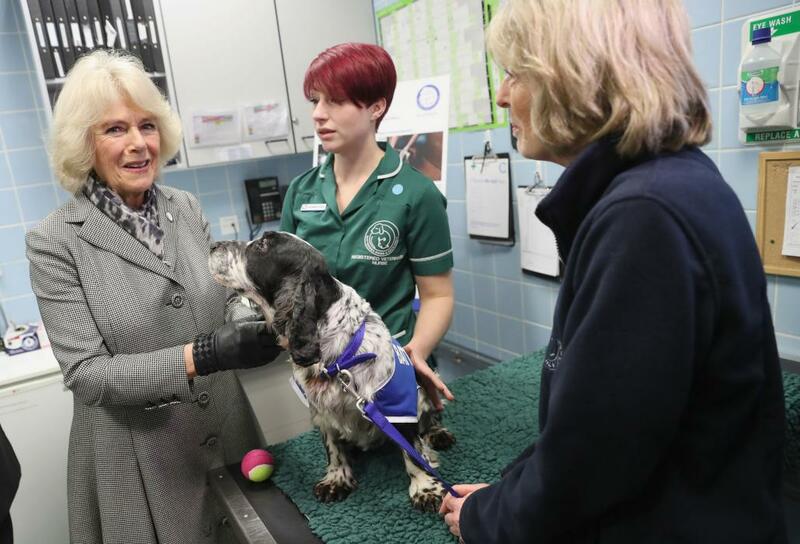 The Duchess of Cornwall visited Battersea Dogs and Cats Home Old Windsor centre today as Her Royal Highness was announced as the charity's new Royal Patron, taking over from Her Majesty The Queen. After being greeted by a dogs' guard of honour, The Duchess toured the catteries and kennels and met staff working at the in-house clinic. Her Royal Highness's Jack Russell Terriers, Beth and Bluebell, were also at the centre. Both are rescue dogs, with The Duchess adopting Beth in 2011 from the charity's London headquarters and Bluebell a year later. At a reception, The Duchess spoke to Battersea Ambassadors Amanda Holden and David Gandy before watching Beth being put through her paces on the outdoor agility course. The Duchess said: "I hope I will be Patron of Battersea as long as I am standing. "I want to thank the walkers, staff and volunteers who do such a wonderful job." Just announced: The Duchess of Cornwall will serve as the new Royal Patron of Battersea Dogs and Cats Home. HRH takes over the Patronage from Her Majesty The Queen.